The Scottish Independence Referendum is over. The question was unambiguous: Should Scotland be an independent country? The answer was equally clear: No. The Sovereign Will of the Scottish people is that we should remain part of the United Kingdom. The number who voted No was 23.7% bigger than the number who voted Yes. Since older folk seem happy with nuclear weapons, child poverty and food banks, don't think they can complain if we slash state pensions. Incredible. 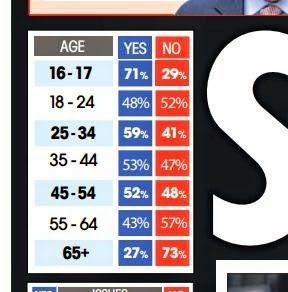 There were majorities for Yes in every age band from 25 to 54 and also 16-17. We couldn't reach the over 65s. 73% for NO. Won't ever be able to look at a Scottish pensioner again without thinking "You. You sold us out." Unfair that if you remove 65+ vote from the referendum the outcome would've been a Yes vote. Hope your pension is worth our future! Even if we could know how people voted by age group, even if there was a systematic trend towards (for example) older people voting No - so what? It's clear to those of us who were close to the numbers in this debate that many of the 1.6m who voted Yes did so on the basis of a false prospectus. Not all of course. 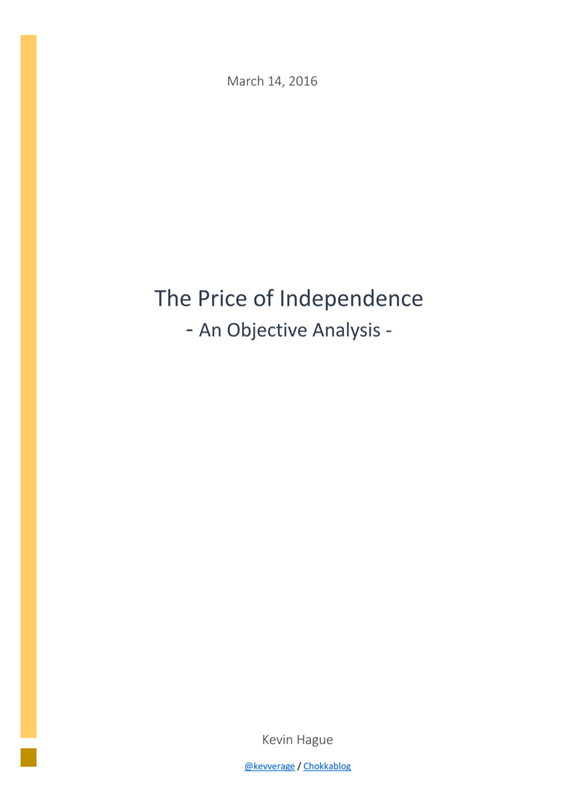 Some Yes campaigners recognised the pain that separation would cause, some were honest enough - in private at least - to admit that we would have been set on a path of austerity-max as an independent Scotland struggled to deal with the economic damage caused by separation; they believed the ultimate prize of independence was worth that pain. Had they argued for Yes despite those economic costs rather than in denial of them ... well, they'd probably have lost the vote by a wider margin, but I personally at least would have found it easier to respect their position. But false prospectus complaints aside, the absolute size of the Yes vote shows that many in our society feel any change at any cost would be better that their current lot. That should - that must - give us pause. Let's start talking about how we address the issues that create the need for food banks, the under-lying causes of child poverty. Many of us arguing for No were insulted by the implication that we didn't care about social justice. We have a duty now to show that not only do we care, but that we care enough to invest time and effort to try and make a difference. There should be some time for sober reflection of course, but let's not lose the momentum of political engagement that's been created. Like it or not the Referendum has created divisions within Scotland and between Scotland and the rest of the UK; there are wounds that will take time to heal. But our ambition should not be to repair but to improve, to reduce the shameful social and economic iniquities that exist within and across the UK. Just don't - right now at least - ask me how. Pathos & Bigotry: as the twittersphere trembles to the aftershocks of the Independence Referendum, I find myself reaching for these two words with increasing frequency. I've just checked to make sure: at the time of writing I have yet to call anybody a pathetic bigot on Twitter. But I have encountered plenty of pathetic bigots in the last few months. In fact I may have been guilty of some pathetic bigotry myself - I'm certainly willing to contemplate that possibility. What about you? 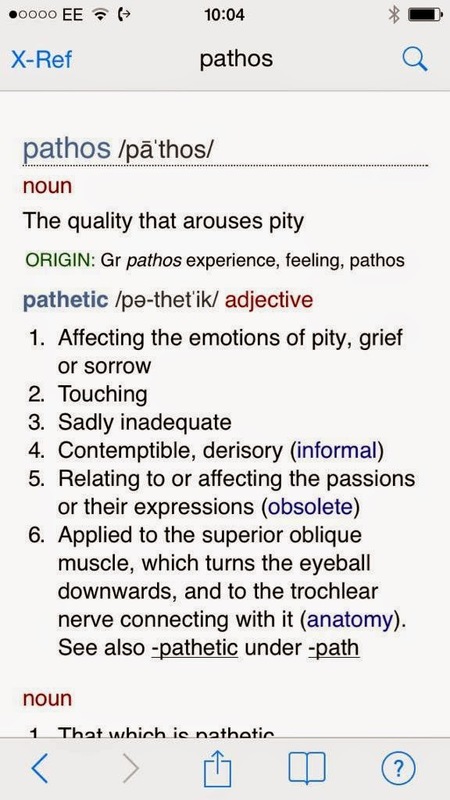 So we can see that whilst referring to someone as pathetic might be interpreted as suggesting they are contemptible, it is equally valid as a way to describe somebody who's behaviour affects the emotion of pity. Of course suggesting the position somebody holds makes them deserving of your pity might be seen as condescending (which means talking down to someone). As long as you're appropriately offended by my condescension rather than inappropriately offended by your perception of my contemptuousness then we can move on. I was going to illustrate this point with the example of Brian Souter who was shortlisted for Stonewall's "Bigot of the Year" award in 2011 for bankrolling the "Keep the Clause" campaign that urged Scottish voters not to repeal legislation in Scotland forbidding local authorities to ‘intentionally promote homosexuality’ (known as Section 2A in Scotland and Section 28 across the rest of the UK). I was going to and then I remembered Mr Souter donated £1m to the SNP and was a vocal supporter of the Yes campaign, so I thought using that example might be seen by some as rather pathetic on my part. 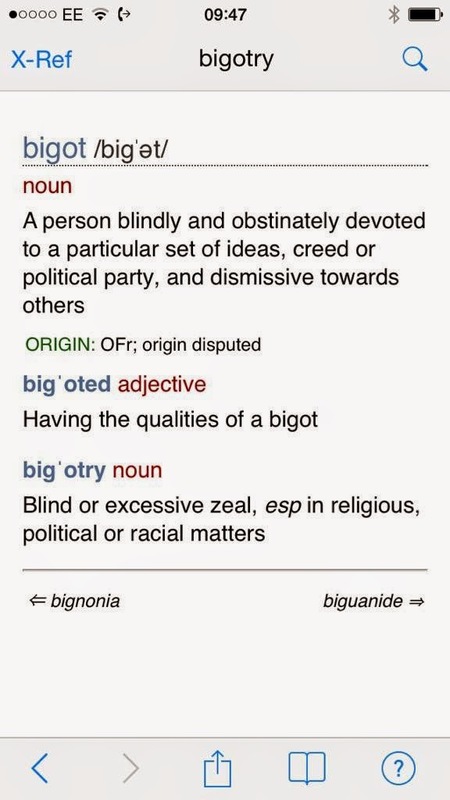 So instead let me test the definition of bigot against my own behaviour. I could certainly be accused of being obstinately devoted to a particular set of ideas. I hope I'm not blindly so and that my musings on this blog are testament to that - but I'm sure some would disagree. But for me the real kicker in this definition is the phrase dismissive towards others. I can think of little more dismissive towards others than the position taken by those Yes voters who suggest that the firm majority of people who voted No were tricked into doing so, that the election must have been rigged, that No voters lack patriotic pride or don't care about poverty and inequality in our society. "false prospectus complaints aside, the absolute size of the Yes vote shows that many in our society feel any change at any cost would be better that their current lot. That should - that must - give us pause." What I hope that statement illustrates is my belief that we mustn't be dismissive towards the concerns of those others who voted Yes. I would hope that similarly those who voted Yes would not be dismissive of the concerns and convictions of those of us who voted No. So the easiest way to avoid being a pathetic bigot is to remember that we can disagree strongly with others' opinions, we can argue that some of them may be ill-informed or misled, but we should never dismiss their concerns. Unless they are simply being pathetic bigots, in which case we should just feel sorry for them.